Just a quick note to let my followers know I am having some elbow surgery on my R arm this Wednesday, August 29th. What that means is no crafting or cardmaking for at least 3 weeks. And definitely no blogging on the computer! So when you wonder why I'm so quiet and not posting projects...well, that is why. Hopefully after 3 weeks I'll be good to go, or I may need physical therapy first. Not sure, I'll cross that bridge as it comes. But don't think I'm gone altogether, just a few weeks. And I believe Amy Purdie has it all figured out for Witt & Sass (perhaps a guest designer while I'm gone?). But seriously, Amy couldn't have been more supportive and understanding. She treats her DT so well. I am truly blessed! So come back in about 3 weeks or so and see if I'm back. I know Amy's got some great fall treats in store for y'all. So it's not goodbye, it's "I'll see you again soon!" Hello again! Welcome back to my blog. Today I have something very special to show you. I made it for the Witt & Sass launch of the "You Are Beautiful" stamp set. My card is sparkly, it's shiney, it's elegant, it's pink and gold, and it's floral!! AND it's a shaker card! What could be better than that? I know, it's very girlie, girl... but I'm sorta that way, so I do love it for a change of pace. Warning- this did take me quite some time to make (but I'm not known for my card-making speed!) 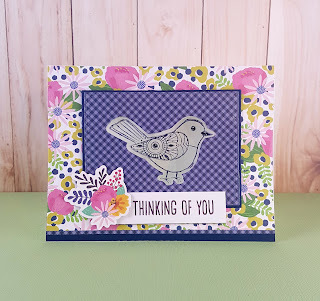 For me, the key to making this lovely card, aside from the great stamps and layered stencils from Witt & Sass, is Gina K's Wreath Builder Stencil. I used the smaller stencil and my MISTI to achieve this nice round/balanced wreath. 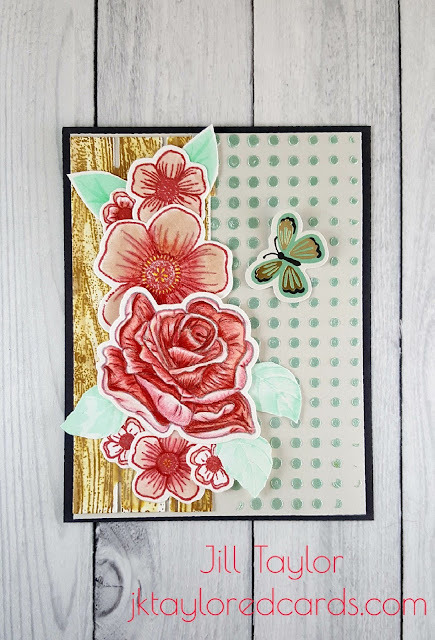 To make this card, I used two products from Witt & Sass: the You are Beautiful stamp set and the Layered Stencil Floral. I started by first stamping the wreath using the largest floral cluster and the largest single flower stamp in the set. I used the Gina K. Designs Wreath Builder Stencil to help me position my stamps and stamp them in a circle. I started with the largest floral cluster and stamped it twice on opposite sides of the cardstock. I then created two masks of each end of the floral cluster, so I could stamp the large single flower in the two gaps, but it overlapped a bit, so that's where the masks came in handy. I stamped the other flower into the gaps, then I used the tiny flower trios in the stamp set to fill in any areas that looked a bit barren. I set this aside to work on my background paper so I would know what colors to use when I colored my wreath. For the background paper I found this lovely pink 6 x 6 paper that had some variation in color to it. Not quite ombre, maybe closer to a watercolor look. 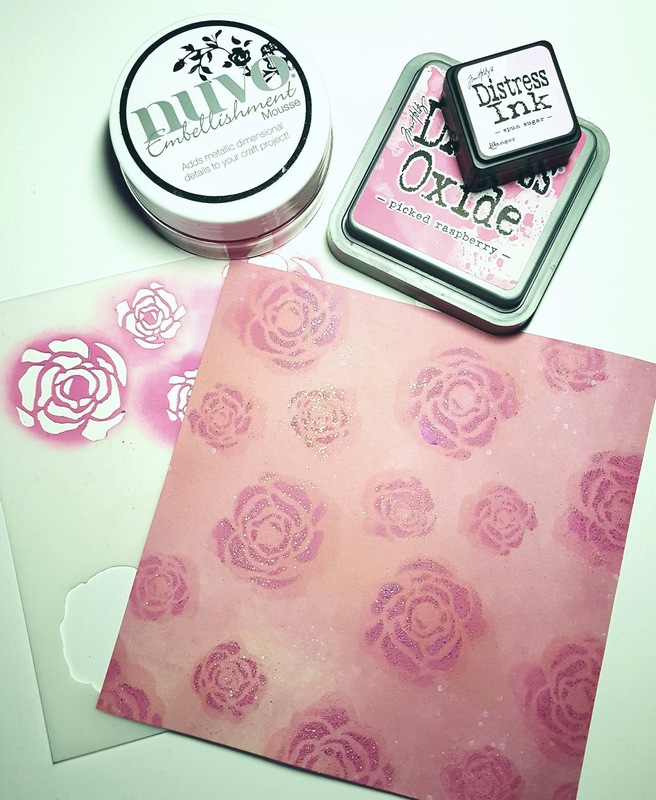 I decided to use the Layered Stencil Floral on it from W & S in slightly darker pinks than the paper (but I did not want it bold). I started by using the floral stencil's solid flower shape and used Distress Ink, Spun Sugar on both the large and small floral shapes. Next I shifted the stencil so that the stencil flower petals lined up with what I just colored. I started with Nuvo Embellishment Mousse in Pink Flambe' on a rag and rubbed it in. It needed additional color, so I grabbed my Distress Oxide Ink in Picked Raspberry and very gently pounced it on with my mini ink blending tool. 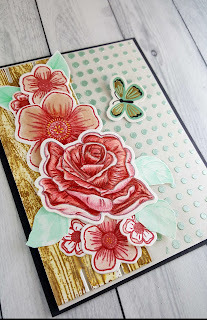 Once a section was done, I quickly ran over to my embossing station and put some Ranger Holographic Embossing Powder over the freshly inked flowers and heat set it. I repeated those steps until my entire pink paper was done. I then trimmed it down to 5.75" on both sides, as I didn't want my card to exceed 6" on any side. (that's something I have to work on before I clean up my space!) Anyhow, then I colored the leaves, again I masked a few areas and tucked in some leaves from the large single rose where I thought it needed more for balance. I used 3 Copic markers in the BG family, then used C5 to make the leaf crease down the center. I colored the small dainty flowers a deep red, then went around with my Sakura Jelly Roll pen in Clear Star to the centers of all the flowers in the wreath. Then I used Clear Wink of Stella on all the roses. 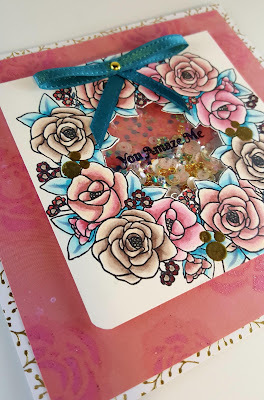 Last, I decided to heat emboss the 3 small circle clusters as a single stamp from the You are Beautiful stamp set. I didn't want them to be too overbearing, so I only stamped them 3 times with Versamark ink, then used my Stampin' Up! Gold Embossing Powder. I trimmed my wreath cardstock to 4" x 4", rounding the two bottom corners. I then went about fussy cutting the inside of my wreath using my handy #11 Penblade (the yellow, pointed one). I placed my wreath cardstock onto the pink background to where I liked how the background flowers showed and left enough reveal on all sides. I cut down my pink layer a bit more and rounded the bottom two corners. Very Important step: If you secure your bow with a brad, do it now before proceeding any further, or it may be impossible to use a brad at all! I made a 3 piece bow from some Stampin' Up! ribbon I had that matched my card nicely. I made a hole through all 3 pieces of ribbon with my pokey tool, put the brad through it, then poked a hole about 1/4" from the top of my floral wreath, in the middle and pushed my brad through the hole and opened the legs on the back side to secure. Next I lined up my wreath paper onto the pink paper, then marked very lightly in pencil the corners. This would help me when I finally adhere my wreath paper onto the pink paper. Next I marked a few points of the inside of the wreath onto the pink paper, then removed the wreath paper and drew a very light almost round circle. I would eventually add my adhesive foam tape around my marked pencil line, ensuring none of the tape would show. But first I needed a piece of acetate for my shaker window. I decided to use one of the floral stamp's sentiment on the acetate. It just barely fit! So that I got the sentiment centered, I went ahead and glued the acetate in place on the backside of the floral frame. Once secure, I stamped the sentiment inside the middle of the wreath, using the help of my MISTI for perfect positioning and no slipping around with the ink. I used Ranger's Archival black ink and did double stamp it to make it darker (not a problem when you use a great stamp positioner!) I set it aside to dry, while I made my shaker element. I used Scotch 3M foam adhesive tape around the circle I had drawn on the pink paper. I decided to make it double think for more dimension and room for more goodies inside the shaker. I carefully used an antistatic tool along the inside of the tape ring so that my shaker elements wouldn't stick to it. I used several products on the inside, all light pink, gold, white, holographic/rainbow, and a few tiny hexagons in those colors and a few blueish-green ones that matched the leaves and ribbon on the wreath. I also used a few pink gem stickers from DCWV inside and outside on the pink paper. I feel that a few elements glued in place inside the shaker helps keep all the shaker elements from falling to the bottom (unless that's what you want, of course!). So once all the shaker bits were added...drum roll please... I very carefully laid down my wreath paper onto the foam adhesive ring (using my corner markers as a guide. One thing I forgot to do was put more double thick foam tape around the rest of my wreath paper. The edges sagged a bit. I had to fix it. I very carefully cut the foam tape lengthwise in half and measured approximately the length I needed. I stacked them up double, removed the release tape and gently wedged them in place along the outside edges. Harder to do this way than to have had it done before I placed the wreath paper down, but you can't tell the difference, so only you and I know!! Last, I chose 6 of the shaker elements and glued them to the pink paper, 3 each on opposite corners. Now, finally, this card is done. Though a little time consuming, I love how it came out, I hope you do too! I can't help myself but shake my card around and look at all the pretties inside! Thank you for visiting my blog (this one more lengthy than usual), I know! I hope to see some of your shaker creations using Witt & Sass products. 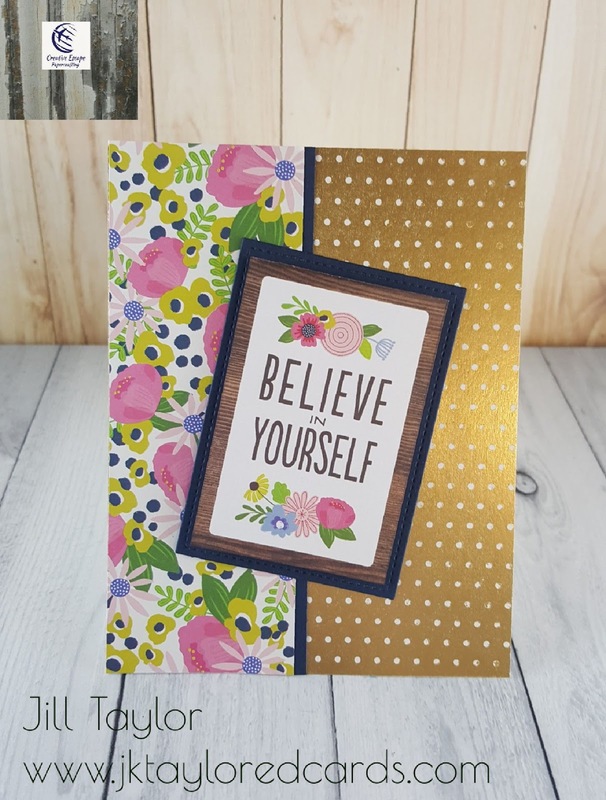 Remember if you are following a challenge from an order you received from W & S, use #wscardchallenge on Instagram so we can see what you create. However, if you just want to see more of my stuff, visit me on Instagram, that's where all my work is located. I'm jktaylor911. I don't blog every card, so IG has so much more! Thanks again, and happy crafting!! 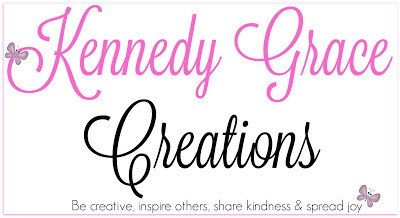 Welcome Sassies & fellow crafters and welcome Friday!! 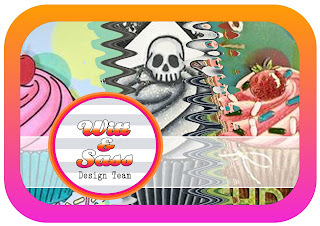 Today will conclude our week of the Designer Cupcake here at Witt & Sass. What a fabulous stamp set, and so versatile (you'll have realized this if you have been following Witt & Sass's Design Team share their card creations with this stamp set all week). 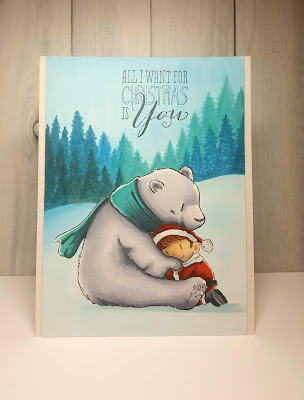 This is card #2 for me (and my favorite)! 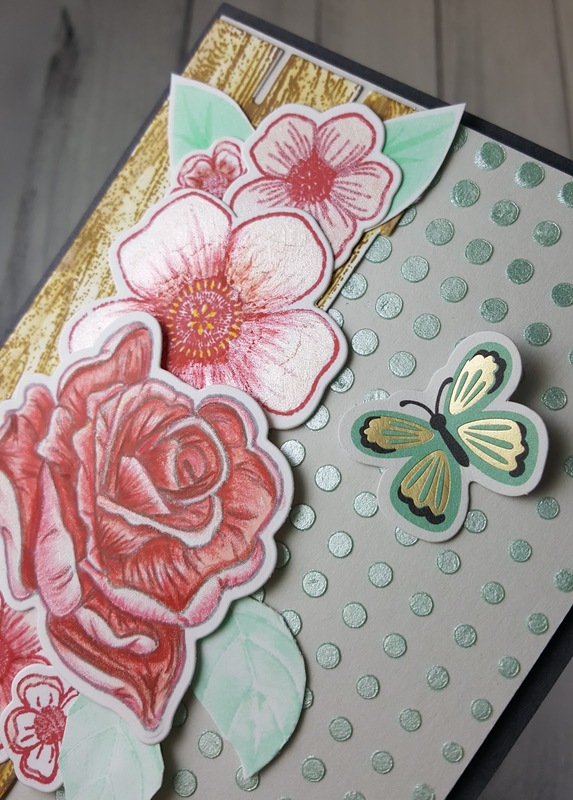 Products used on this card include: Designer Cupcake stamp and Layered Stencil Dots. I started off with a teal colored ombre paper that I used the W & S Layered Stencil Dots on with my Distress Oxide inks. I used several colors and overlapped the different sized circles, then set it aside to dry. 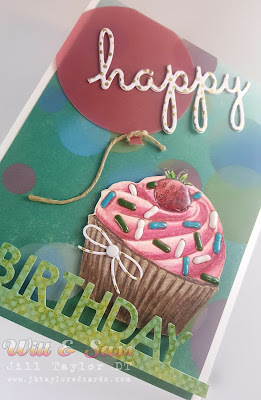 Next I stamped my plain cupcake in Antique Linen Distress Ink so I could do a little "no -line coloring. I started with my Copics, then added additional details and highlights with my Polychromos colored Pencils. I then stamped the strawberry on another piece of card stock, colored it, then fussy cut it out. I also fussy cut my cupcake out as well. I decided to use die cut elements from my Blueprints 26 die from MFTs. I used the balloon, the words "happy & Birthday" and a small bow. I decided to die cut some of the card elements from paper I found in one of my 12 x 12 paper packs from DCWV. This one was actually for DIY projects, mostly mini albums, but I liked the paper so I used it! The balloon is cut from a very thick, colored vellum that looks very much like the texture of the bokeh dot background I had made. I also die cut the word "Birthday" from that paper pack as well. For the "happy" and the cupcake bow, I used a foiled cardstock from a 6 x 6 DCWV Gold Foil Cardstock stack (white with gold foil dots) as the card needed some light/brighter elements. I die cut the "happy" three times and glued them together for a slightly more raised, less fragile look to the word die cut. With everything cut and colored, I arranged the elements onto my colored background. I decided to cut down the width of the colored piece so that I could mount it to a standard white top-folding A2 card base and have the white show on both sides of the card. I also decided to cut my die cuts to overlap onto those white edges, I like that effect. Since the "happy" was in front of the balloon element, that was where I strategically placed my adhesive for the vellum balloon, so it wouldn't show. I also decided to pop up the "Birthday" sentiment strip as well, to give the card more dimension. I cut a slit in the top of my cupcake icing so that the base of my strawberry would disappear into the frosting. It was at this point I decided I needed some additional shine and dimension to my card. I grabbed my strawberry and loaded on a thick layer of Glossy Accents onto it and set it aside to dry (overnight). I then stamped the elongated sprinkles onto my cupcake then chose 3 coordinating colors of Nuvo Crystal Drops and somewhat randomly filled in the candy elements with the very dimensional and opaque Nuvo Drops. I set that aside to dry overnight as well. The next day, I assembled my card and lastly grabbed a piece of natural hemp twine and tied it to the balloon, placing a glue dot underneath to keep the twine from loosening up. I also coated parts of the twine with clear drying glue so it would keep it's shape and adhere to the paper. The final touch was the tiny white/gold bow (same paper as the "happy" die cut) and enamel dot that I adhered to the cupcake! Drops look and that I don't use them enough in my card-making (especially since I just HAD to have so many colors!) So remember to look around your craft space for embellishments you've not used in a while - you'll probably come to the same realization I did... "why don't I use these more?" Thank you for visiting me and to all you Leo's out there - HAPPY BIRTHDAY! Products I used are: (those in red from the August Kit). I started by preparing the iridescent glaze for stenciling. I scribbled a moderate amount of the green VB Art Crayon onto a stamping block then added maybe a teaspoon (or less) of the glaze and mixed it up to give me this beautiful mint green color. I used the Altenew Half Tone stencil I bought from CEP and taped it to the light grey cardstock from the backside. I then spread out the green glaze I had made but left the edges imperfect. I set it aside to dry. 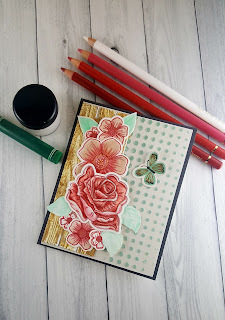 Next I stamped the flowers, using Memento London Fog on the rose and Lawn Fawn's Chili Pepper from the kit for the other flowers. First I colored the rose in R20 Copic marker, just leaving what would be the lightest parts of the flower white. I then moved to using my FC Polychromos pencils. Originally I picked out 6 colors, but as I started to color, I realized I only needed 3 + white. Once done coloring, I used some clear Wink Of Stella on the lightest parts of the flower. For the other flowers, I decided to first color them with the VB glaze, but instead of green, I used a Distress Crayon in Dried Marigold mixed with the glaze. I used it full strength on the large flower, then diluted it with more water for the mid-size flower, and diluted it again for the smallest of flowers and only used it in the center and curled tips of flower petals. I wanted them all to look slightly different from one another, yet clearly grown from the same garden! I decided once the glaze was dry (didn't take long) to add some color with the same FC Polychromos pencil colors as the rose. I used it for shading near the centers of the flowers. I also used a yellow glitter pen for some of the details in the center of the largest and middle sized flowers. Once the coloring was done, I die cut everything out with their matching dies. It was at this point that I decided to make a wood pallet from Concord & 9th's Petals and Pallets stamp/die set. I stamped the long wood planks in Distress Oxide Ink- Gathered Twigs, die cut them out with the matching die, then I wet a paint brush and loosely spread out the color. To finish it off, I grabbed my Distress Oxide Ink in Walnut Stain and added darker areas where it seemed logical. Next I adhered the plank to the left side of my stenciled cardstock. As I was arranging the flowers, I really felt that I needed leaves to have it look right. I used the leaves from the C & 9th Petals and Pallets because they looked like rose petals to me. I rubbed off more color from the green Art Crayon onto my block, then just added water (not too much). 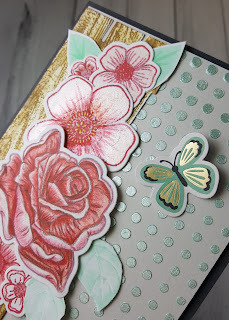 I then used my paint brush to brush the color onto the leaf stamp and stamp it onto some plain white cardstock. I loved how they came out. I ended up using three of them (I fussy cut them out). The other two leaves I stamped in similar fashion but they were flat cling foam stamps from Tim Holtz idea-ology called Cutout Floral. I decided to add some detail to the leaves by using my Tombow markers in just a slightly darker color than the leaf. I fussy cut those as well. OK, it's showtime! I placed all the elements where I wanted them, then grabbed some Press-n-Seal and pressed the sticky side down so I could lift off the arrangement just as it was. Then starting with the top most layers, I glued each piece down on my pallet area. I did decide to pop up the rose as I wanted her to stand out the most. Once everything was adhered, I grabbed the cute butterfly from the ephemera pack and glued one half down and placed some foam adhesive behind the other wing to keep it at the desired angle. I trimmed my card panel to 5.25" x 4" and centered it on the provided charcoal cardstock. I then adhered that to my top folding heavy white cardbase. Voile', my card was done! I hope you enjoyed my card and how I used the Vicki Boutin products. More to come! Please visit CEP's Facebook page for lots of inspiration from the Design Team and all things CEP. Thanks for stopping by, happy crafting my friends! 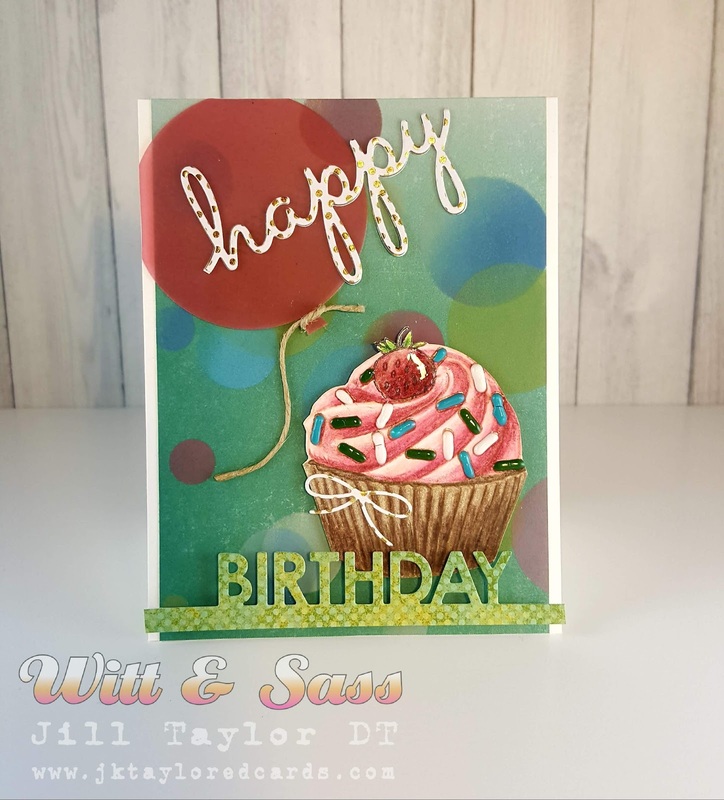 Well hello my crafty friends, today I am sharing a card that I designed for the Witt & Sass release of their Designer Cupcake stamp set. I had so much fun with this set that I made 2 cards. The other one will be posted on Friday, 8/24. I like this card a lot, but I saved the best for last! 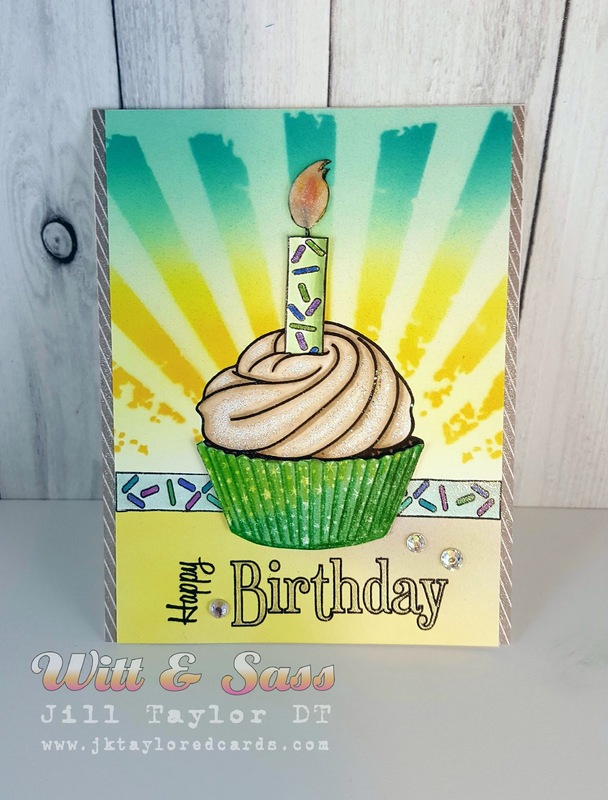 For this birthday card I started by stamping the main cupcake image in black Amalgam ink from Gina K. I then restamped the bottom of the cupcake on some mint green patterned paper with stars with Peeled Paint Distress Ink. I used a combination of Distress Inks and Prisma Colored Pencils to create this fairly realistic looking cupcake wrapper. I fussy cut it and set it aside. I masked my cupcake on my card panel and airbrushed the background lightly with some yellow, light blue, and light blue/green Copic markers (see picture). I decided to use the candy trim piece in the stamp set in the background behind my cupcake, delineating the sky from the surface the cupcake was on. I then grabbed my Tim Holtz "Rays" Layering Stencil and from above the candy trim piece I positioned my stencil and colored in the rays of light from yellow-orange, to yellow, to light yellow, to light blue to medium blue-green, and finally the medium/dark blue-green using my Copic markers and airbrushing the rays. 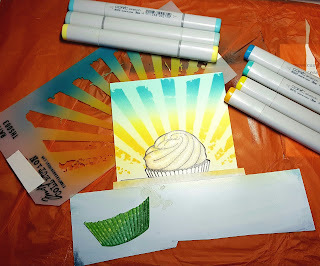 I them masked everything from above the base of the candy trim and airbrushed that area below a light yellow-green, with giving a hint of a shadow by using a light greenish-tan to the right base of the cupcake. I colored in the candy trim piece with Copic markers and added some shimmer by using some Wink of Stella clear to that area. I colored in my cupcake's frosting and small area of cake showing with my Copic markers. To help make the cupcake more sparkly (cuz sparkly is good! ), I used my Nuvo Glue Pen to the highlighted areas of the frosting, then sprinkled some Hero Arts Prisma Glitter. I love the effect! Much more glittery in person. I then grabbed the cupcake wrapper and glued it in place. 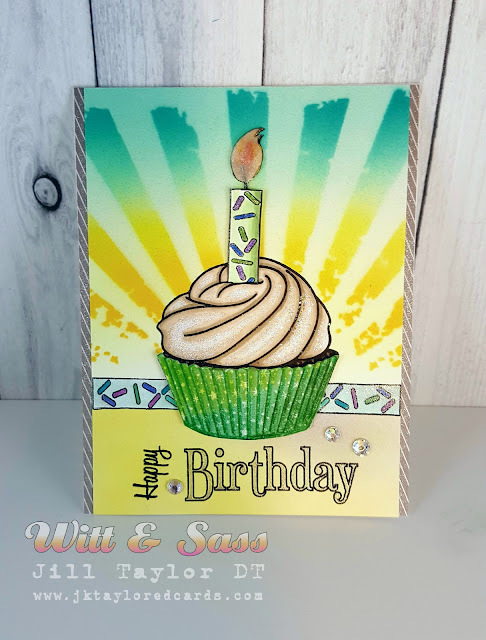 To make my candle, I stamped the candy trim again on a piece of scrap cardstock and colored it similarly to the strip in the background except that I made the blank area more greenish to go with the cupcake wrapper. For the wick, I grabbed a medium thickness twine, colored it black then coated it with the Nuvo Glue Pen to both make it stiff and stick to my card. For the flame, I drew a flame onto some white cardstock then traced that image onto some 40# vellum. I fussy cut them both out. I colored the cardstock piece with my Copic markers and then colored the back side of my vellum piece. I first adhered the cardstock piece behind the "wick" then placed the vellum piece on top of the "wick." Because the wick was not dry yet, the vellum stuck to it nicely. I added some clear Wink of Stella to the vellum flame for some shimmer. Last I stamped the Happy Birthday sentiment from the Designer Cupcake stamp set underneath my cupcake in Versafine Black Onyx Ink. I then colored in the "Birthday" word using my Sakura Gelly Roll pen in Clear Star (it is very shimmery). Before I adhered my card panel to my base, I trimmed the card to be 4 inches wide so that I could add some trim to each side of the card. I picked a somewhat neutral color stripe that coordinated nicely with the color of the frosting. You notice it, but it's not so loud that it competes with the focal point of the card. Once all the layers were adhered together, I grabbed some medium sized clear gems and glued them onto my card as shown. That completes my Designer Cupcake card #1. I hope you enjoyed my card. 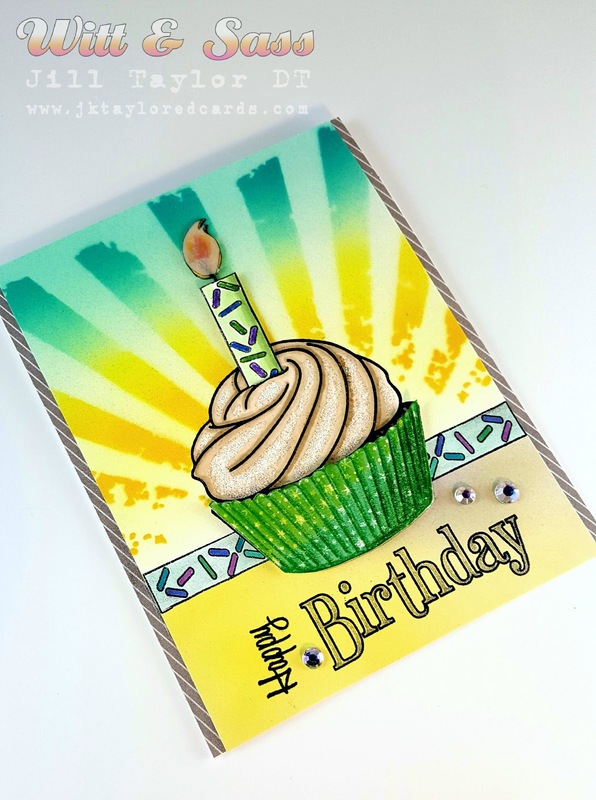 There are so many options for your cupcake with this stamp set, I hope my card inspires you to give it a go! 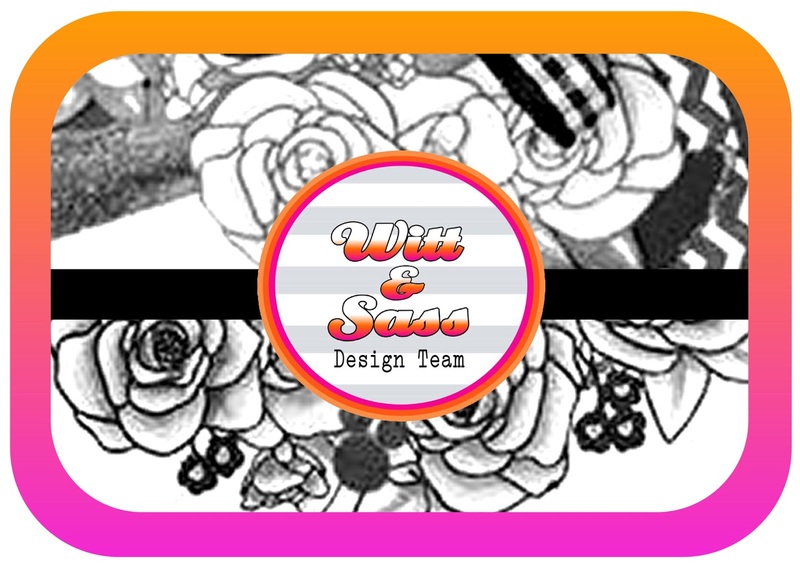 I have linked all Witt & Sass products to the store and placed links to the social media sites as well. 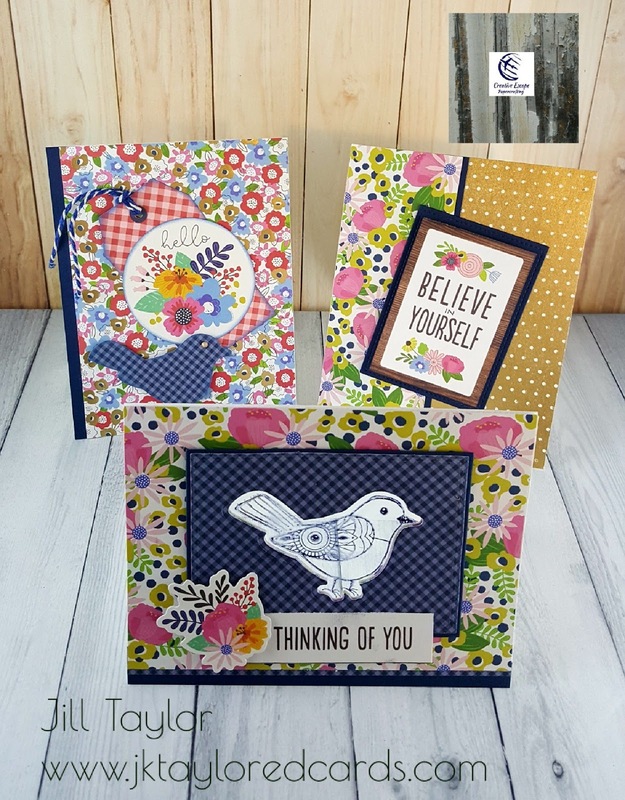 Hello my friends, here is my first post Guest Designing again for CEP, this their August kit. Now this kit is just fabulous! I made these 3 cards in record time (for me! ), and I have so many more ideas in my head to do, just not the time. I wanted to do some cards strictly using the kit's supplies (well mostly!). In reality I used just a few of my things, but much less than is typical for me. This card came together quickly. I picked the patterned paper I was going to use and the coordinating Navy cardstock. I die cut the two layered rectangles using my Gina K. Designs Stitched Rectangles (Large and Small) so they layered closely together. Once glued together, I die cut the bird shape from the dies included with the Vicki Boutin stamp set. I then stamped the bird image on a piece of acetate cut smaller than the two rectangle pieces. I used Ranger Black Archival ink, allowing it time to dry. In the meantime, I cut my A2 white card base, floral background paper, and the two strips of matching paper and adhered them as shown. 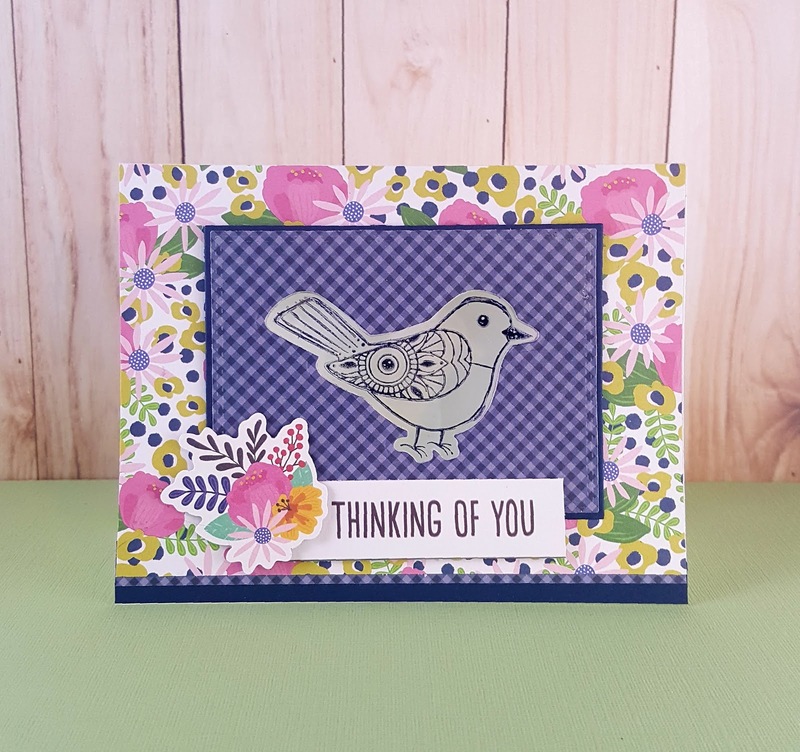 I then positioned my die cut pieces onto the prepared cardbase then placed the bird die inside the previously cut pieces and ran it through my Big Shot so that it was perfectly aligned when all the pieces were put together. Before adhering everything together though, I glued my stamped acetate onto the back of the die cut rectangle pieces, then adhered it to my card base. 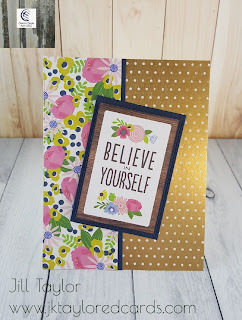 I picked out the coordinating floral ephemera piece along with one of the cut out tags that I liked and popped them up with some dimensional adhesive, and I was done with the first card! I think this card was the quickest of the three. Because I loved the floral paper in the first card so much, I decided to use it on the second card. I found another nice coordinating ephemera piece and bordered it again with the Navy cardstock from the kit. I picked out the lovely foiled dots paper from the kit and adhered them side by side with a strip of Navy cardstock between them to my white A2 card base. I decided to pop up the ephemera piece on top of the Navy cardstock for more dimension then adhered them both to my cardbase at an angle as shown. This last card took me slightly longer to pick out the pieces I wanted. I knew I wanted the foiled and floral paper for the background and the red and white plaid tag, but stumbled a bit before choosing the other pieces. It was almost like there were too many great choices, really. 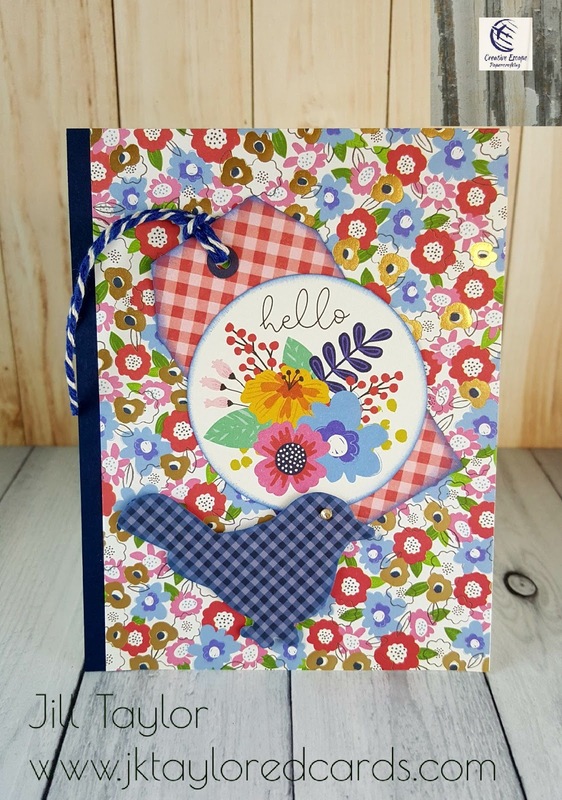 In the end, I chose the round floral Hello piece and one of the die cut blue plaid birds I cut out from card #1. I placed a strip of Navy cardstock along the left edge and as I was arranging the pieces, I decided to bring in a little more blue to the ephemera elements and the bird. I decided to use my Distress Oxide Ink in Faded Jeans to just use along the edges of all the pieces. I then grabbed the blue and white twine and added it to the top of the red and white tag. I adhered everything down, but decided to pop up the bird element and add one of the golden gems in the kit for the bird's eye. Card #3 done! I hope you enjoyed my cards and got a little inspiration as well. I will challenge myself on the next few cards to do some fun coloring and use some of Vicki Boutin's art crayon and iridescent glaze. Don't forget to visit me on Instagram, as they have my largest selection of card creations. I am jktaylor911. 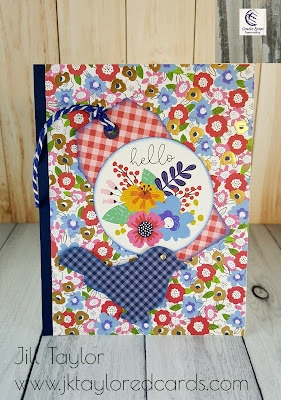 Please visit the store, there are so many new items to see and a newly redesigned online store at https://creativeescapepapercrafting.com Also visit their Facebook page to see what all the talented designers are creating, as well as new happenings with CEP. For your convenience, I've linked everything to the store and social media. Good bye for now, and blessings to you all! Tropic like it's Hot, Baby!! I'm having my own "Tropical Party" here on my blog, celebrating the release of this fabulous Tropical Party stamp set. Sorry, I was sipping my Mai Tai as I was daydreaming about being on that beach! OK, I'm back now and can tell you how I put together card #2 for this stamp set. I used 4 Witt & Sass products to make this card: 1) Tropical Party stamp set 2) Background Builders stamp Sand and White Caps 3) Background Builders stamp Palm Tree 4) Background Builder Wave Stencil. Ok, let's start at the beginning, shall we?! I started with my A2 sized NSW 80# cardstock in the vertical position. I sort of started in the wrong place, but I did it intentionally as I didn't want to have to mask my flamingo for this part (I tell you, I am truly lazy at heart!). I decided I could start with the sky, using the BB Waves Stencil, then later stamp my flamingo's head so only the fruit would be in the sky. I figured I could color the fruit dark enough to cover the orange (it mostly worked). I positioned the stencil so I would have enough room to stamp the sentiment in the clouds at the top. I then blended my Distress Oxides Ink from a medium bluish purple into yellow then into an orange color just at the horizon. After removing my stencil, I used a BVOO Copic marker to add a shadow at the base of the clouds (similar to the Layered Stencil Cloud). 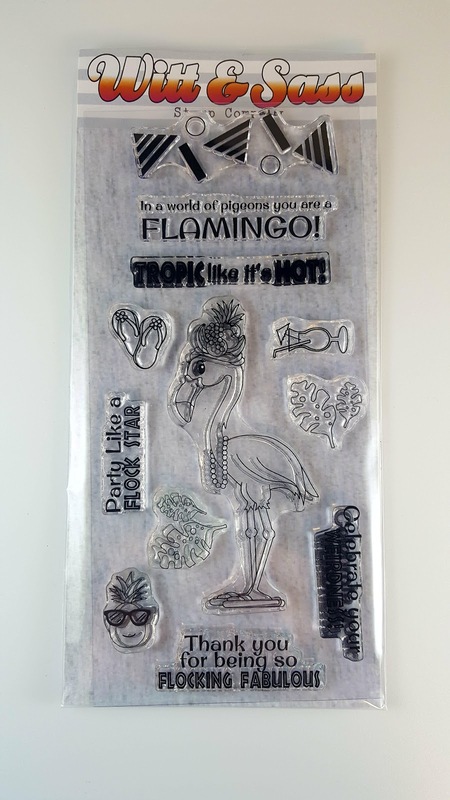 I then stamped my flamingo in Gina K's Amalgam black ink and also made a mask for her so I could work on the background elements. Using the BB Sand and White Caps, I stamped where I wanted the sandy beach to be and the sandy area for the palm tree. As there seemed to be too much "open water" in the background, I decided to make a sand bar further out. For that I actually used the BB Wave Stencil and used the wave elements with Versamark ink and embossing powder (I wanted some reflection, like it was a little wet from the waves crashing into it). I started out with gold embossing powder, then used the narrower wave on the stencil on top of the gold embossing powder and applied silver embossing powder. I did it a couple times to add more dimension to my "sand bar." I then went about coloring the water with my Copic markers, using the BV's near the horizon to pick up that color in the sky, then moved closer in and changed into several layers of blues and blue/greens. I left a wide area where I wanted to blend the sand and the water together. I stamped my palm tree on a separate piece of paper, then colored it with my Copics and fussy cut it out. I worked on the sandy area for my palm tree, Adding more dots for the sand with a slightly darker Copic marker. I repeated this in the pale areas of the water close to the chore. I adhered my palm tree and added a shadow in the sand. Next I stamped the sand along where my flamingo was standing, using the BB Sand and White Caps stamp. I decided to white emboss some of the waves in the water and also use one of the white caps stamps to create a small "wave" right on the water-line of the beach. I white embossed that as well. It was finally time to remove the mask and Copic color my beautiful flamingo!! My plan of covering up the orange in her fruit hat worked well except for the bananas. I ended up using a white gel pen to color in the bananas first, then add color on top of that. It worked! I also added very small white reflection marks on some of the fruit with my gel pen (it really made the fruit come to life). I also added small white highlights to my flamingo (on her back and legs) and a bit to the palm tree trunk. Back to my Copics, I added some shadows in the sand around the flamingo as well. I returned to the top of my card and stamped the sentiment from the Tropical Party stamp set in Versafine Black Onyx ink. I cut down my card panel to a width of 4 inches, then I mounted it to a turquoise A2 top folding card base. Again, as I always do, I looked at my card and felt something was missing. I had left the string of pearls white on my flamingo, but now I had a better idea! 💡 I went to my embellishment drawer and found some small sticky backed pearls that were strung together (just like my pearl necklace!!) I layed out the pearls on my card, around my flamingo's neck and Yes!! I was now done. I hope you enjoyed my card, I love doing scene building cards! I hope this gives you some inspiration of your own, and try using some of the products you have not only as they were intended, but perhaps in some other creative capacity (like the stencil I used for the embossed sand bar or the sticky backed pearls for a necklace!). 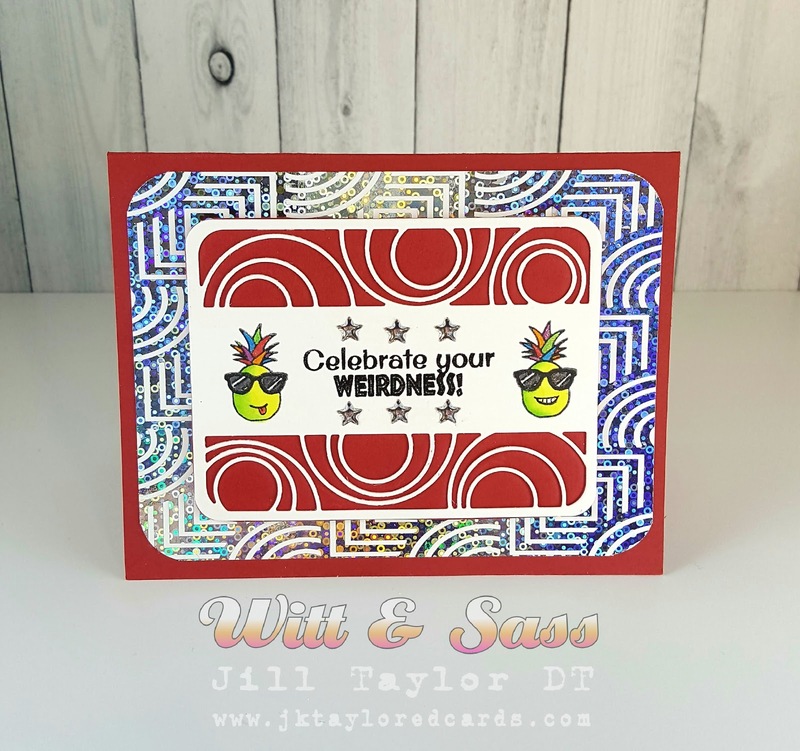 To see other Witt & Sass design team creations, go to Witt & Sass Facebook page (you'll need to join first), or check Instagram @wittandsassstampco. Also the store's website has lots of inspiration and information about W & S, some of it really funny, really! 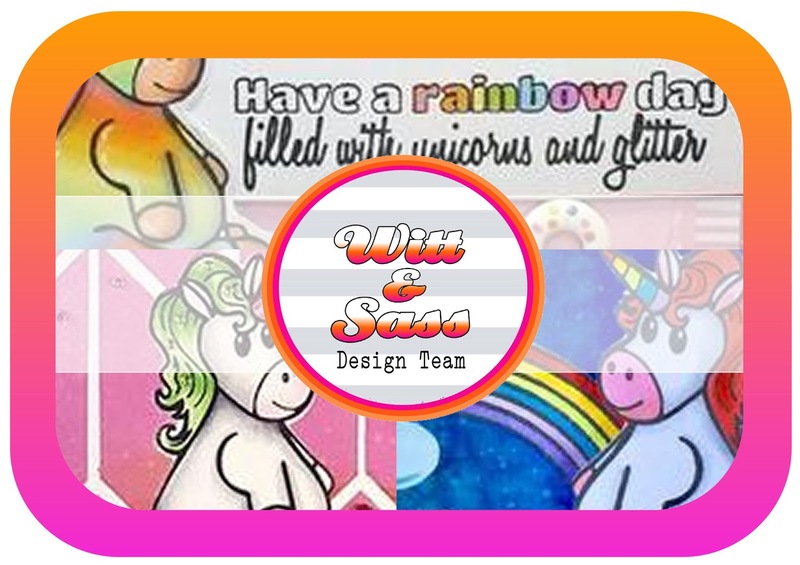 Their website is https://www.wittandsassstampcompany.com/ Also, don't miss out on all the Blog stuff, too. 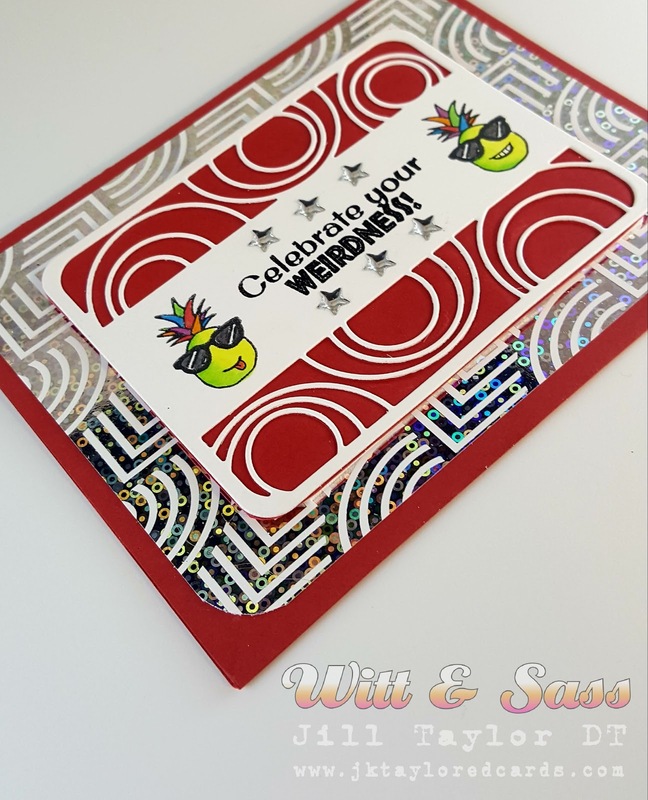 You'll find that at https://www.wittandsassstampcompany.com/blogs/news However, if you just want to see more of my stuff, visit me on Instagram, that's where all my work is located. I'm jktaylor911. I don't blog every card, so IG has so much more! 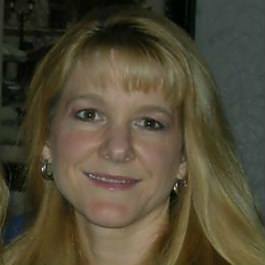 Hi there and happy you made it back to my blog!! 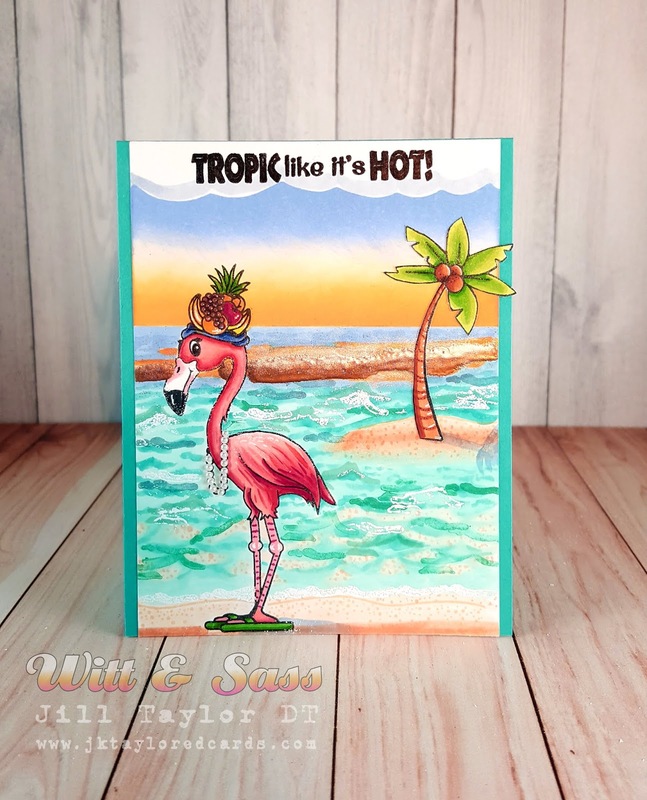 This week it's a "Tropical Party" at Witt & Sass! 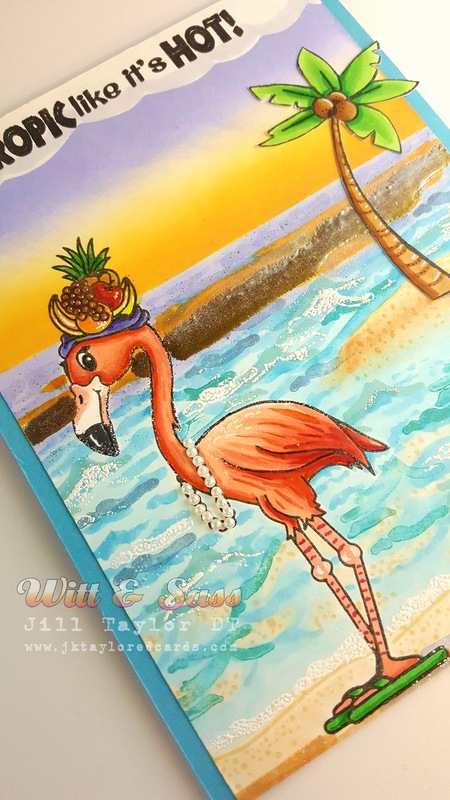 My first card focuses on the funny sentiment and small pineapple image from the Tropical Party stamp set that I slightly modified 😁 Look at the stamp image below my card and see what I changed. 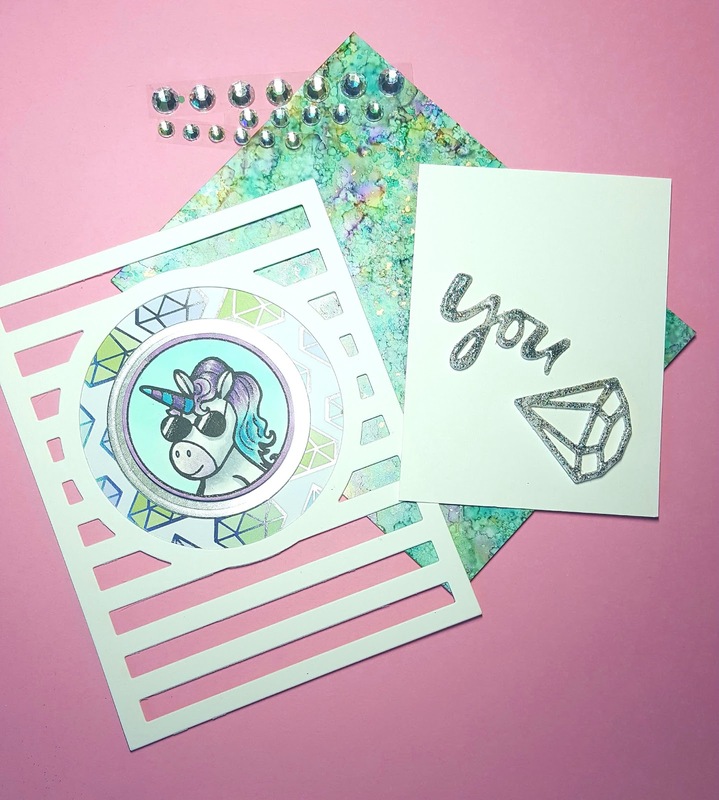 To make this card, I started by die cutting the Concentric Circles Die by Neat & Tangled for Catherine Pooler's Stamp of Approval release. It is a smaller die, like for a notecard, so I opted to layer it on some striking foiled cardstock by Creative Vision Stamps. It comes as pre-designed toner sheets that you foil with the heat transfer foil of your choice. I used Gina K. Designs Fancy Foils in Silver Sequins. I rounded the corners to match my diecut. To adhere my die cut, I opted to emboss the red cardstock with the Concentric circles die, then fussy cut around it to match my diecut. With embossing the red cardstock, the white die cut sort of "settled in" to the embossed layer and made adhering it much easier (plus the delicate circles almost seem to sink in a bit, which is a cool look, I think). 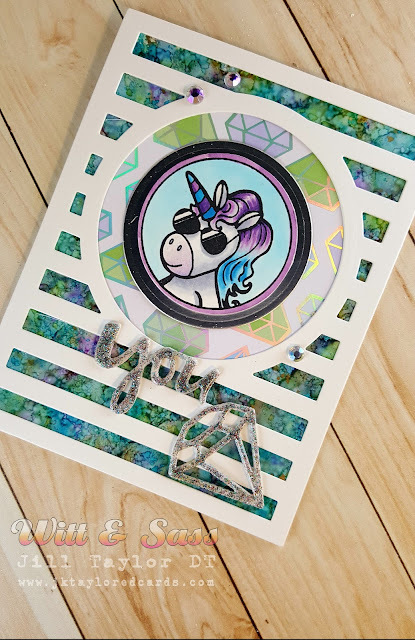 I then stamped the sentiment from the Tropical Party stamp set in the middle of the white band of cardstock with Versafine Black Onyx Ink then added some clear embossing powder to make it pop even more. Next I stamped my pineapples and colored them first with my Copic markers, then used my At You Spica Glitter Pens to add subtle sparkle to the colored tops of the Pineapples and their glasses (used silver sparkle on the glasses). I next added a layer of adhesive backed Fun Foam behind the red cardstock that was layered behind my die cut piece for a little dimension, then adhered it to my foiled layer. I then adhered that to my A2 top folding base layer red cardstock. I added some adhesive backed epoxy stars from Stampin' Up! and looked at my card. It wasn't quite right. That's when I knew I had to change the mouths on the pineapples. I got out my black, fine tipped Faber-Castell Pitt Artists Pen and made that final adjustment. Yes... that was much better!! I hope you enjoyed my somewhat "weird" card! 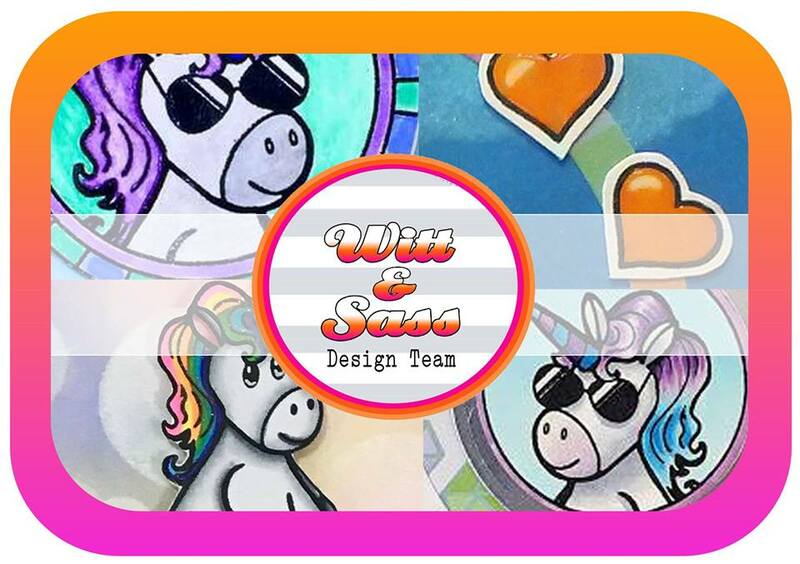 To see other designer's creations, go to Witt & Sass Facebook page (you'll need to join first), or check Instagram @wittandsassstampco. Also the store's website has lots of inspiration and information about W & S, some of it really funny, really! Their website is https://www.wittandsassstampcompany.com/ Also, don't miss out on all the Blog stuff, too. You'll find that at https://www.wittandsassstampcompany.com/blogs/news However, if you just want to see more of my stuff, visit me on Instagram, that's where all my work is located. I'm jktaylor911. I don't blog every card, so IG has so much more! Welcome back to my blog, friends! 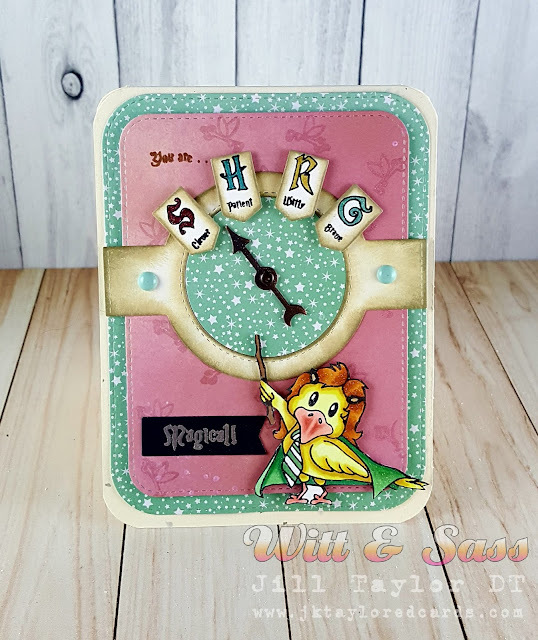 Hopefully you are returning to see what kind of card I am making with Witt & Sass's Magical Creatures stamp. I have created a "Harry Potter-esque" type of card! I decided to use the bird with a magic wand in my card. I colored the bird, who I decided looked like Ron, with my Copic markers, giving him red hair, of course! For a little shimmer, I used the At You Spica Glitter pens on his hair and cape, then I fussy cut him out. I decided on this card to use a MFTs Blueprints 31 die set to help me design my card. All of the elements on my cardbase are cut from that die set. I also had in my stash some Game Spinners from Tim Holtz idea-ology. I chose the antique brass finished hardware as I planned to have a somewhat distressed look to my card. I used some patterned paper from my stash for the background areas. On the pink ombre paper I clear heat embossed the little flying key all over it in different directions. I die cut the round frame piece with tabs off to the sides twice so I could have the star paper as the inside circle on my spinner apparatus. I distressed the spinner frame with Distress Inks to all edges then glued the spinner pieces onto the pink layer. I marked the center of the spinner, then made a hole with my pokey tool for the brad to go through. I first placed the dial in place then put my brad's legs through the hole and then opened them on the backside of the pink panel. I stamped the "You are..." in brown ink, then clear heat embossed it. Next I distressed the 4 banners in the same way I did the spinner frame. 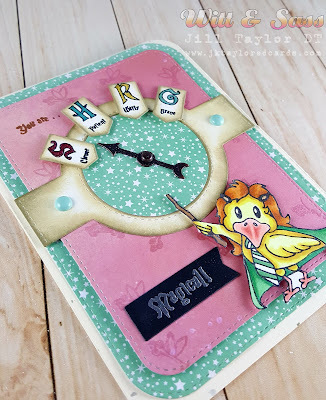 I then stamped each of the 4 character letters onto the banners and colored them with my Copics, then added some shimmer with the At You Spica Glitter pens. I arranged them evenly across the top of the spinner and foam mounted them for a little dimension. I added some aqua enamel dots from my stash to either side of the spinner. I then foam mounted my "Ron" bird so he was pointing at the spinner. Last I added the black banner that I silver embossed the word "Magical!" on from the Magical Creatures stamp set. 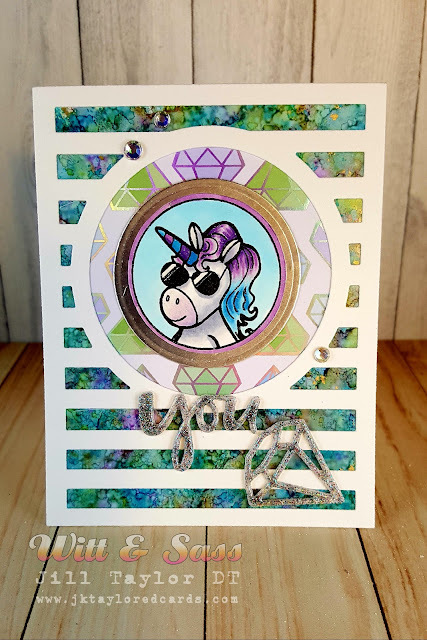 I adhered everything with some Fun Foam onto the stars patterned paper for more dimension, then adhered that to my A2 ivory card base that I had rounded the corners on. And that completes my card! I really enjoyed being a little creative with this one. I hope you enjoyed it as much as I did. 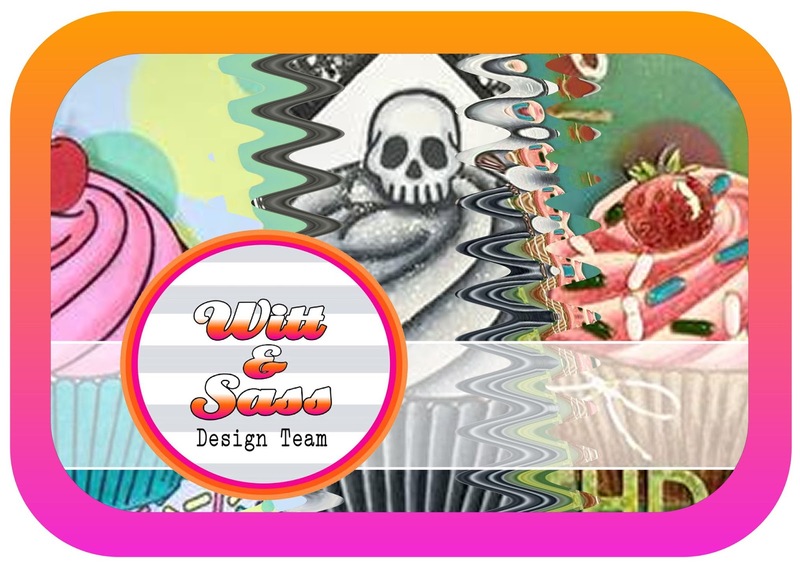 To see what the other designers are creating and all things Witt & Sass, go to their Facebook page. You can also check out @wittandsassstampco on Instagram as well. Lastly, the store's website is https://www.wittandsassstampcompany.com/ and here's a link to their blog here, as well. On the store's site you will find lots of inspiration and information (some of it really funny)- so don't miss it! If you would like to see more of my creations, visit me on Instagram, I'm jktaylor911. I post all my creations there as I don't blog every card I make. Thank you again for visiting me, see you next week for the launch of another new stamp set for Witt & Sass Stamp Company! Happy crafting and many blessings to you! Welcome back my friends, today I am sharing the 2nd card I made as a member of the design team for Witt & Sass's launch. This week has been all about the Chubby Unicorn, and this card I originally made as an example card for W & S's card challenges (this challenge specifically dealt with the colors pink and green, rectangles and rhinestones). 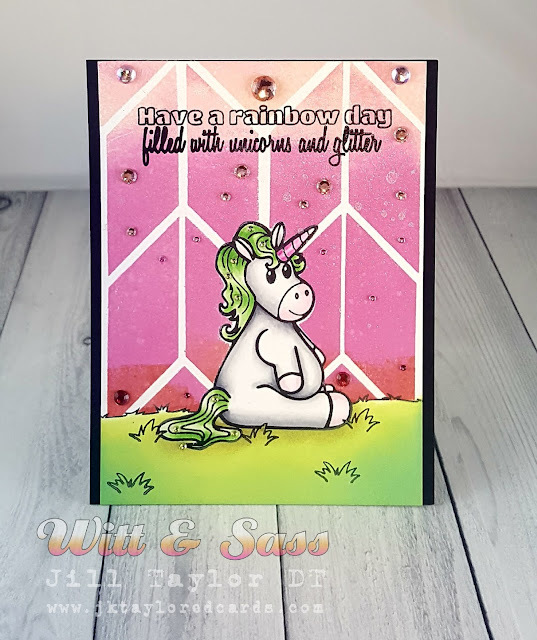 I started out by stamping the Chubby Unicorn in black Amalgam ink from Gina K. I then stamped the grassy area around him using the 2x3 BB stamp Grassy Hill. I made a mask to cover up my stamped images, then went to town making the background. For that I used Distress Oxide inks, starting light pink at the top and ending in a redish-pink color at the grass line. I used Altenew's Simple Shapes XL to stamp the rectangle shapes. I spritzed it with shimmer spray before removing the masking. 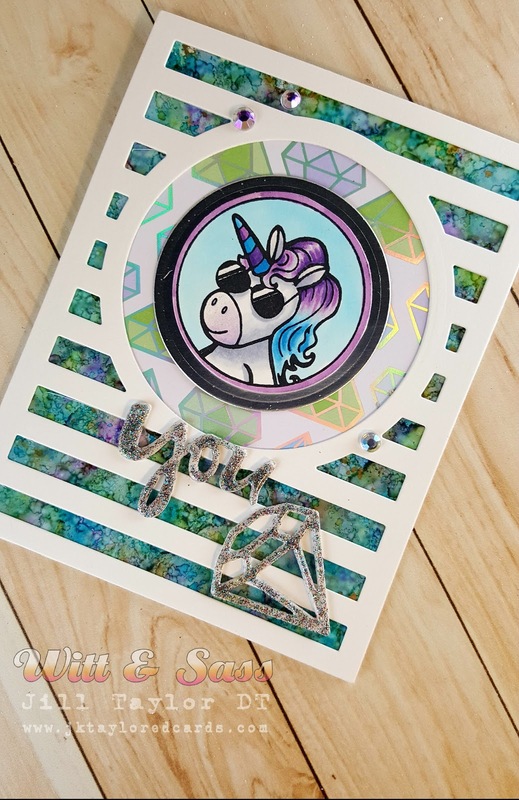 I stamped a sentiment from the Chubby Unicorn stamp set in Versafine Onyx Black pigment ink, then covered it in clear embossing powder and heat embossed it to my card base. Next I colored the grass, again with Distress Oxide inks with the mini ink blending tool. Satisfied with the background, I Copic colored my Chubby Unicorn and used some clear Wink Of Stella to the hair and horn. I trimmed the cardstock to 4" x 5.5", allowing me to mount my card panel onto a slightly wider A2 sized black cardstock base. I then adhered multiple sized rhinestones to the background, following the transition in color from top to bottom. The rhinestones at the bottom I colored with some red Copic markers as I didn't have that color gemstone. Finally, I added the very small green rhinestones to the unicorn's hair and tail. Stay tuned for card #3 tomorrow. And again, I love questions and comments. Happy crafting and blessings to all of you!